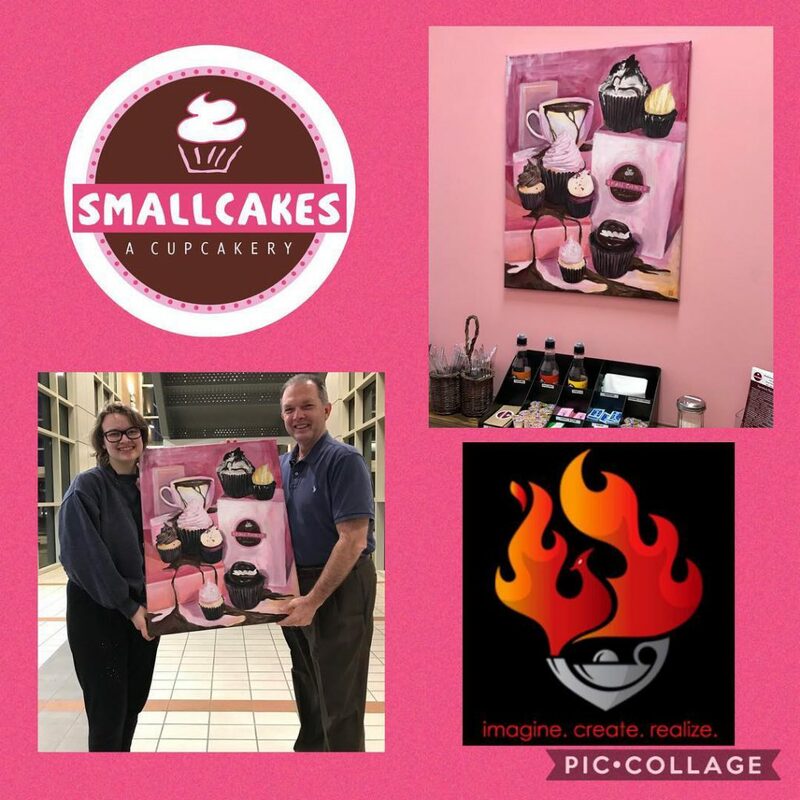 Bottom-left photo: Stan Patrick (right) of Brookhaven, business owner of Smallcakes Hattiesburg, poses with MSA visual senior Hannah Arnold (left) of Brookhaven and her newly comissioned piece. The next time you visit Hattiesburg, Mississippi, stop by the new Smallcakes cupcakery where you’ll find hanging artwork by a visual student from the Mississippi School of the Arts. Hannah Arnold, a senior from Brookhaven, Mississippi, recently accepted the proposal of painting an art piece to hang in the bakery’s condiment space. “I thought the offer to paint something for a cupcake shop sounded very interesting and fun so I accepted it right away!” said Arnold. And although the finished painting looks just as delicious as the real thing, Hannah took advantage of the opportunity to satisfy her taste for sweetness. “The shop consists of some beautiful cupcakes and hot, nice coffee, so I wanted to combine the two. They graciously gave me some cupcakes to look at and eat, so I arranged them in a still life with a cup of coffee. The cupcakes were extremely delicious after I finished taking the pictures!” she said. Hannah is planning to attend Bradley University in Illinois to major in Animation and Game Design. Smallcakes Hattiesburg is located at 6555 Hwy 98 West, Hattiesburg, MS.